NOTE: The instructions below show a single Panel Drug Test. Multi Panel Drug Tests are used in a similar way. The difference in the multi Panel Drug Tests is that they have several panels (depending on the number of drugs being tested for). Each panel on a multi Panel Drug Test will test for one to 3 drugs (depending upon the drug screen test being used). Allow the drug test panel, urine specimen, and/or controls to equilibrate to room temperature (15-30°C) prior to testing. Bring the pouch to room temperature before opening it. Remove the test panel (drug test strip) from the sealed pouch and use it as soon as possible. Take off the cap outside of the test end. 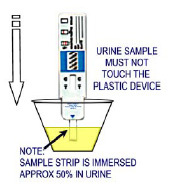 With arrow(s) pointing toward the urine specimen, immerse the drug test panel vertically in the urine specimen for at least 10-15 seconds. Do not pass the arrows on the test panel when immersing the panel. 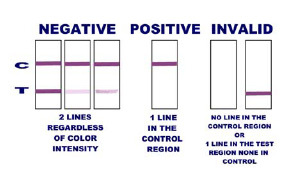 Note illustration shows a 1-Panel Drug Test card. The same procedure is followed for a mulit-Panel Drug Test card. Place the test panel on a non-absorbent flat surface, start the timer and wait for the colored line(s) to appear. The results should be read at 5 minutes. Do not interpret results after 10 minutes. For more information, visit our Lab Confirmation page.